According to Table 2, the 27 sectors of the 3 enfolded Type A polygons have 26 corners (24 outside the root edge) and 52 sides (51 outside the root edge). The (3+3) enfolded Type A polygons have (27×2=54) sectors with (2 + 24×2 = 50) corners and (1 + 51×2 = 103) sides, i.e., 153 corners & sides. 153 is the number value of ELOHIM SABAOTH, the Godname of Hod. 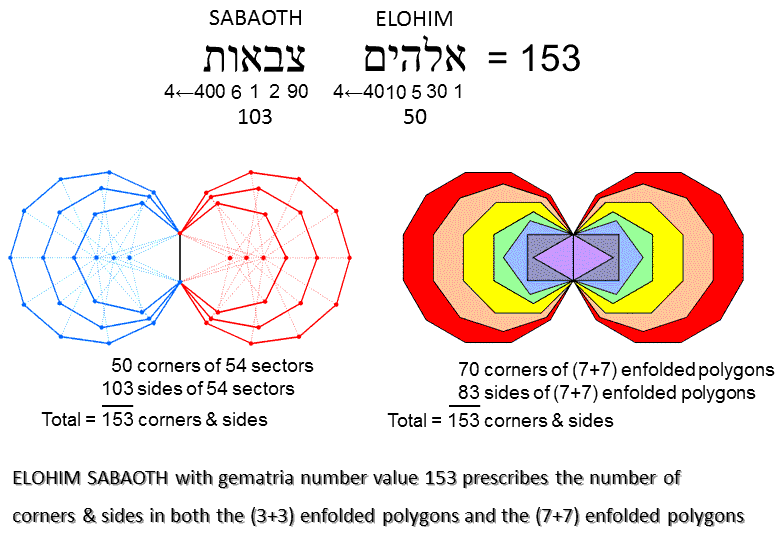 ELOHIM with number value 50 measures their 50 corners and SABAOTH with number value 103 quantifies their 103 sides. Here is remarkable confirmation that: 1. the number value of ELOHIM is NOT simply the sum of its letter values, as often stated in Kabbalah, but that the value 40 of its letter mem undergoes contraction to 4, and 2. the value 400 of the letter tau in SABAOTH undergoes contraction to 4. The (7+7) enfolded Type A polygons have 70 corners and 83 sides, i.e., 153 corners & sides. Remarkably, this is the same as the number of corners and sides of the 54 sectors of the (3+3) enfolded Type A polygons. According to Table 2, the 3 enfolded Type A polygons have 157 yods. Four yods lie on the root edge, leaving 153 yods outside it in each set of polygons. 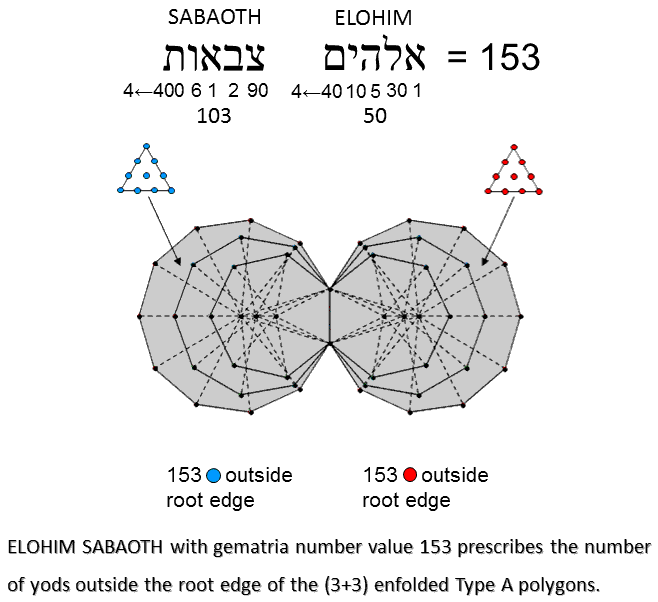 ELOHIM SABOTH with number value 153 prescribes the (3+3) enfolded Type A polygons.